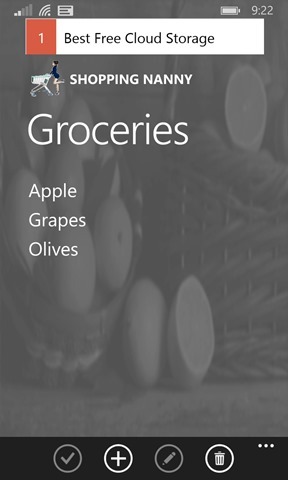 So a few weeks back I was trying to get a windows phone application working that I have now called “Shopping Nanny”. This application is now completed and has been submitted to the store. Once it gets approved, I will make an announcement on here, but in the meanwhile, I thought I would write a few blogs about some headaches I encountered in the hope I can assist others with a few less head banging episodes. One of the most important and elegant things that XAML has to offer is the DataTemplate. It’s great in it’s simplicity to combine various controls into a “template” that is then used in a parent control. Here is a simple example, and the example I will work off of the rest of this post. It uses the ListView control combined with the DataTemplate that holds several child controls to create the look and feel of the ListView. Obviously, this is a screen shot of my app, but the list portion will look almost identical. Wait… so The DataTemplate is Great right? What’s the problem? The name of the TextBlock is “ShoppingItem” rights? Well if there are a list of them, there is nothing to differentiate one ShoppingItem TextBlock from the other because they are not unique. For this reason, you need to use some technique to walk the XAML tree and get the control you want to get data from. Remember that XAML is just another tree structure like XML, HTML JSON and any others!! Any of these can be traversed one way or the other. So how does one traverse the XAML tree? Well, there are plenty of ways I’m sure you could manually do it, but the most efficient way to accomplish this is using the VisualTreeHelper to find the control for you. There are several helpful ways to use the VisualTreeHelper to get the results you need depending on your needs at the given time. The foundation of what I designed was based heavily on Jerry Nixon’s blog post here. If you don’t currently follow him, I highly recommend him! We will start with a common albeit simplified scenario and work through it to access the control we need with the example above. So you have the same list as defined above, but now you also have a button on the screen that when pressed, you want to get anything in the list that has a particular text value (lets say apple) and turn that item in the list green. In this case, you cannot key off of what is selected in the list view, because it may not be correct and you cannot key off any other ListView event to get this information because it can be changed by the user at any time prior to clicking the button (we are assuming here to add some complexity that the list is editable). So how does one address this when subscribing to the button’s click event? Take a look at the code below and then I’ll explain it in detail. /// Retrieves the children of any type by control in the XAML Visual Tree. The code above first and foremost utilizes generics to identify the control(s) the caller wants to retrieve and uses the FrameworkElement as the dynamic type that any object being searched must inherit from. Often, the Control class is used which most UIElements fall under. The reason I raised the class to be higher in the tree (UIElement –> FrameworkElement->Control), is because a TextBlock is not considered a control or at least does not inherit from the Control class. I do not remember why, but it does not. I’m sure Microsoft has an interesting reason not to have it in there. in any event, this was my reasoning for doing it. The object that is passed should be the root control you wish to traverse. In this case, we will pass in the Listview, but technically it can be any object that inherits from DependencyObject. DependencyObject is to XAML what the object is in normal .NET. That’s not 100% true, but close enough for this post. For this reason, by using DependencyObject, you can pass any control into the method, including user controls. The rest of the method loops through each child in the root object (using VisualTreeHelper.GetChildrenCount(root) and checks if that child is of the dynamic type mentioned in the call. If it is, it adds it to the list to return. If it doesn’t, then it uses recursion to then traverse that object and see if it has any children that are of the type you are looking for. This continues until it reaches the end of the tree (or no more parent objects). Once this happens, the list of controls matching the type provided is returned. So how do you call this wonderful method? As you will see below, it’s pretty straightforward. First, we define the object we want back, in this case TextBlock. Then we pass in the root object, in this case the ListView (which in our example, it’s name was ShoppingListView). There is only one piece I added which was the LINQ query to get the first textblock that had it’s text a value of “apples” per the scenarios requirements. In conclusion, DataTemplates are a very powerful and useful tool for the front end development of your application. it has some pitfalls in the backend development, but nothing that can’t be worked around with a little TLC!! This entry was posted in .NET, .NET 4.5, ASP.NET, C#, Classes, Data Binding, Design Binding, LINQ, MVVM, Programming, Windows Phone, Windows Phone, Windows Store Apps, WPF, XML and tagged .NET, C#, data binding, data template, datatemplate, visual, visual tree, visual tree helper, visualtree, visualtreehelper, windows, windows phone 8.1. Bookmark the permalink.